Brendan Shanahan, President and Alternate Governor of the Toronto Maple Leafs, announced today that Lou Lamoriello has been named the 16th General Manager in the Club’s history. Lamoriello joins the Leafs after previously spending the last 28 years in the New Jersey Devils organization. 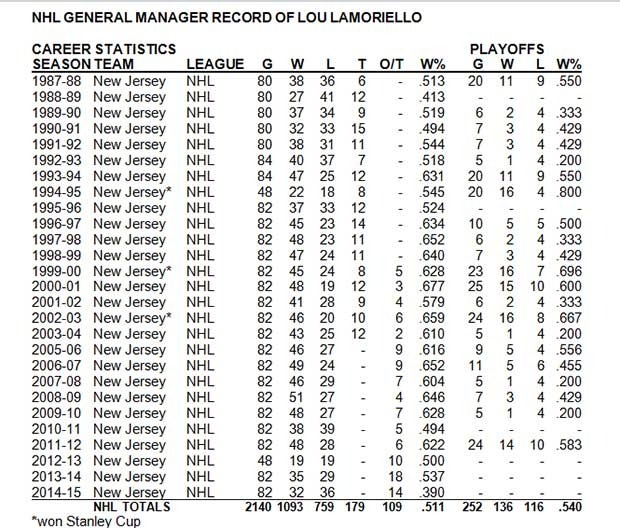 Lamoriello also served as Interim Head Coach during three different seasons – most recently the 2014-15 season as he served as co-coach alongside Scott Stevens and Adam Oates for the final 46 games of the regular season (20-19-7). On May 4, 2015, Ray Shero was introduced as the Devils’ new General Manager while Lamoriello remained in his role as President of Hockey Operations. He finished as the longest serving General Manager of any one team in the history of the NHL at 28 years (1987-2015). In 1996, Lamoriello served as General Manager for Team USA as they won the World Cup of Hockey. He was also General Manager of Team USA at the 1998 Nagano Winter Olympics. His many accomplishments have earned him a number of prestigious awards, including induction into the Hockey Hall of Fame in the Builder Category in 2009 and into the U.S. Hockey Hall of Fame in 2012.